Market Manager Larry McClements joins Assemblywoman Christy Smith, D-Agua Dulce (L) and Santa Clarita Mayor Marsha McLean (R) to welcome En Fuego BBQ to the Old Town Newhall Farmers Market. | Photo: A. Rios. 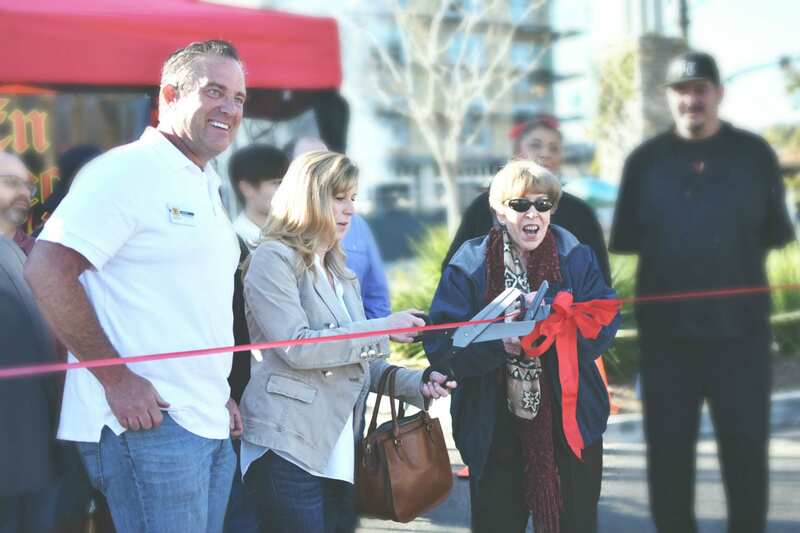 Santa Clarita Mayor Marsha McLean and 38th District Assemblywoman Christy Smith (D-Santa Clarita) attended ribbon-cutting festivities on Saturday to welcome new vendor En Fuego BBQ to the Old Town Newhall Farmers Market. En Fuego BBQ is branching out from solely a catering operation to serving BBQ every Saturday at the Farmers Market. They will be serving Santa Maria-style BBQ including chicken and tri-tip cooked on a genuine Santa Maria-style grill over red oak. There will be side dishes as well, all made from scratch. The Old Town Newhall Farmers Market is a certified farmers market chartered by the City of Santa Clarita. It is held every Saturday, rain or shine, in the parking lot of the Old Town Newhall Library at 24500 Main Street from 8:30 a.m until 12:30 p.m.